The area around Victoria in Central London has been a rich source of new images this year. On my regular trips to London, if I have the time, I take a walk around the area searching out images. Each day brings something new and one learns how critical the light is to images. There are days when this huge building looks drab, and days when it positively sings. And an image can make a world of difference to that day. Click on the image to see the enlargement – it really does make a difference. 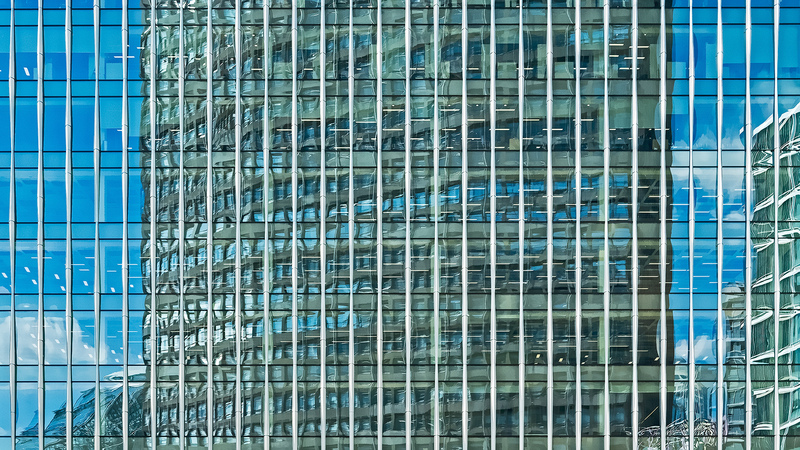 This entry was posted in Architecture & Buildings and tagged Glass fronted buildings, Glass reflections, Photograph. Bookmark the permalink. It looks like a reflection in tropical waters. Even the gradations in color are tropical; I see at least a half-dozen blues in one frame. Beautiful. It’s the colour that really caught my eye – a lot of the glass used for these facades is tinted, add in a reflected blue sky and the colours are dramatic. I love it blown up….what a wonderful wall this would make. Well done! And I wish you more and more inspiration through 2019. Have a great holiday! Many thanks Lynn, and a Happy Holiday to you you too.